Their third daughter, Mary Eleanor, born in 1896, would be Norma's mother. "Not much is known of Mary Ann's childhood but it seems that her two unmarried Aunts were very strict. Following the death of her Father some years later the Aunts became even more protective of their niece and selected, with care, her friends and how she spent her leisure time. The Aunts were business women who owned several retail shops in the area. The shops specialised in the sale of Tripe and cooked meats. 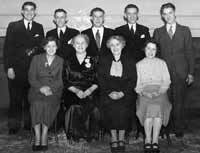 As tripe was a regular part of the working class diet in those days, the businesses thrived and the Aunts became very conscious of what they saw as their middle class status in Society. Imagine their horror and shock when eighteen months later, Mary Anne announced that she was pregnant and demanded permission to marry her working class boyfriend Whilst no doubt attributing Mary Anne 's behaviour to her Theatrical 'roots' and the supposedly loose morals of people who worked in that profession, and to avoid the shame and disgrace that Victorian Society would heap upon an unmarried girl and her family, the Aunts reluctantly agreed to sign the form of consent for the marriage. From thereon they said they would disown Mary Anne and she would lose the considerable inheritance that they would have willed to her on their deaths. The out-cast Mary Anne and her new husband, James Thomas Sutton, went to live in a house adjoining the Newsagents shop owned by her Parents-in-law in Ancoats, Manchester. Mary Anne was to hear of her Aunts only once more during the rest of her life. The couple married when Jim was aged twenty four and Mary Anne nineteen. With the help of Jim's parents they made a poor but comfortable home next to the shop. Some months later, on the 26th July 1890 their eldest child - a daughter - was born and named Edith. When Edith was a few months old one of Mary Anne's Aunts died and to her surprise she found she had been leff a legacy of Three hundred pounds, (a very considerable sum of money in 1890) . The young married couple decided to follow the family tradition and invest the money in a business. Jim did some alterations to the house and they opened their home as a Greengrocers shop. Jim continued with his job as a Brass Finisher at the foundry and Mary Anne would go to buy fresh fruit and vegetables, from the local Wholesale Market, in the very early hours of the morning, then tend the shop throughout the day. Some of the Wholesale Market traders were not very honest and often Mary Anne would return with seemingly fresh barrels of fruit and vegetables, then quickly find that the produce in the lower layers of the barrels was badly bruised and damaged The long hours, the tiring walk to and from the wholesale market at four o'clock each morning began to tell their tale on Mary Anne. Instead of the bright bubbly young woman of two years before, she became tired and weary. The couple's hopes of making a comfortable living finally faded when Mary Anne found she was pregnant again and their second daughter Emily was born on the 3rd February 1892. With two young babies, Mary Anne was unable to make the necessary vsits to the Wholesale Market and the Greengrocers shop was closed and became a private house once again. 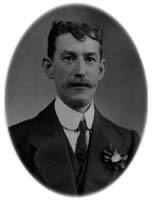 On the 19th August 1893 a son was born and named Richard after Jim's Father. Two and a half years later a third daughter was born and named Mary Eleanor. This little girl was known as Nellie and mary years later became the Mother of Norma. During the next few years the family moved house between Ancoats and Oldham several times, always following Jim's search for work. Two other sons were born, George Ernest on the 11th September 1899 and Arthur Wilfred on the 2nd December 1900. 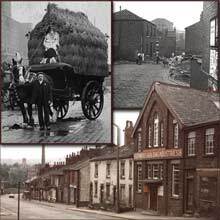 The family finally settled in Oldham after Arthur's birth, initially living in Noble Street and then moving to what was to become the family's permanent home at number 1 Snowden Street. The house seemed very spacious to the family of growing children, who had become accustomed to extremely cramped and over-crowded conditions, but the six roomed house with no bathroom, no supply of hot water and a tippler toilet shared with the people next door, had few of the basic comforts which we now take for granted. The large kitchen had a sink called a ''slopstone' (similar to a large hollowed out flag), a stone flagged floor, which must be mopped and sand-stoned regularly, a small, uncarpeted Living Room with a Kitchen range, i.e. an open fire with an adjoining oven which provided the family with heating and cooking facilities. The oven and the fire were the focal point of the Living Room and twice weekly, the oven and fireplace had to be 'black leaded' (painted) and polished. A large room at the front of the house was divided by Jim into a Hall and Sitting Room. This Sitting Room was for use on Sundays only and contained Jim's pride and joy, a Pedal Organ. The Sitting room had one other use, this was as an occasional bedroom to be used when Mary Anne was delivered of her babies. There were three permanent bedrooms in the house which were shared between the parents, (and current new baby), the boys and the girls. A shared yard at the back of the house contained the toilet. The water that worked the tippler system came from open drains leading from the sinks in the two houses. On the 18th June 1903 another baby girl was born and called Annie Farnell. The child 's second name was given by her Mother as a tribute to her own deceased parents and in order that the name would not be forgotten. Jim was fastidious in his dress, and even when finances were at their lowest he would be seen with a well starched collar, a flower in his coat lapel and a walking cane. He was known in the area as 'Gentleman Jim Sutton'. On the days that Jim would receive his wages, the children would wait for their Father to return from work, when he would hand Mary Anne, or Mother as she was then known, the sum of seventeen shillings, this was to pay the rent, buy the food, fuel, clothes and generally maintain the household. Not surprisingly, Mary Anne was forced to seek the cheapest sources of food for her family and it became a regular occurrence for the her to visit Oldham Market late on Saturday night, when meat and vegetables were sold cheaply, to clear them before the market closed at 11 pm. On the 20th April 1906 a son Frederick was born and three years later on the 3rd March 1909, their youngest son Victor James. Mary Anne's life, although one continual round of washing, cooking and cleaning was considerabbr brightened by her enjoyment of her children and of music, usually sung by herself or by the children. On Sundays Jim would play the pedal organ and all the family would gather round and learn some of the well known hymns. Very occasionally, at Jim's insistence, Mary Ann would accompany him to visit one of his Clubs. With such a large family, inevitably, there would be occasional accidents or illnesses which were usually treated by Mary Ann. At times, when the local Doctor would have to be called to visit the house or the family visit the surgery, bills and medicine for treatment were paid at the rate of six pence per week. Although the children suffered the usual childhood ailments of Measles, Chicken Pox and Mumps, generally no serious illnesses were encountered. Mary Anne had the help of the local Midwife when her babies were born, but little or no assistance from a doctor. Mary Anne's busy world came to a sudden stop when her daughter Annie, the little girl who entertained the family with her beautfull voice singing popular songs of the day, became ill. No amount of love, care or herbal remedies appeared to help; and the doctor was called. The doctor diagnosed that Annie was suffering from Meningitis, an infection of the brain tissues. Although the doctor tried his best, in the days long before the discovery of Antibiotics, he fought a losing battle. 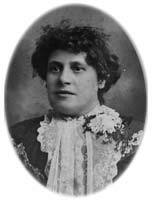 Annie Farnell Sutton died on the 15th June 1911 aged eight years. Her Mother, Mary Anne, quietly told her eldest daughter "this is the end of me .. this will kill me." As Mary Anne was once again pregnant and as her pregnancy progressed, she became more and more depressed and her general health deteriorated. On the 4th September 1912 a baby girl was born and named Madeline. Mary Anne did not recover from the birth as on previous occasions. She was extremely tired and on the Doctor's recommendation she remained resting in bed for a prolonged period. The Doctor also prescribed that Mary Anne take a long convalescent holiday, away from the hustle and bustle of the family and in the fresh seaside air. Unfortunately the family finances would not stretch to this and Mary Anne had to make do with resting in her own home. The family were cared for by the older girls, in between their work in the local Cotton Mills, and with assistance from their good neighbours. Even whilst resting Mary Anne attempted to help run the house by preparing food whilst lying in bed and directing the cooking by her two older daughters. ln spite of the care and attention given to her by the family, Mary Anne 's health deteriorated and six months aher the birth of her youngest child, on the 15th June 1913, and whilst sitting in her favourite chair, Mary Anne died. Following the death, Jim and his young family had to re-organise their lives. The eldest daughter, Edith, took charge of the household and with the help of her sisters cared for the young ones. Finances were an enormous problem, particularly as Edith was compelled to give up her job as a 'Big Tenter' in the Cardroom, a skilled job that had previously brought in a reasonable wage. Besides the washing, cleaning and care of the children, there was, of course, the purchase and preparation of food which had to be bought carefully and economically. Breakfast at 5 a.m. for the Workers of the family, was usually a piece of bread and Margarine (or Dripping) with a cup of tea. Jam sandwiches had to be made for the workers' lunch and a hot meal prepared for tea. Tea was the main meal of the working day and Stews or Meat and Potato Pie were cheapest. A special treat on an occasional Sunday was a piece of Brisket of Beef always with lots of vegetables to help out the meat. Any small pieces of meat and gravy left over, combined with even more vegetables, formed the main meal of the following day. To supplement their diet the younger children of the family were given Butter Milk, which is similar to the low-fat milk of today. When pay-day approached and the finances were running particularly low, Oatmeal Porridge would be made with water, a little butter milk poured over the top and a small sprinkling of sugar. lf 'Father' was delayed returning home with his wages, soup made with hot water and salt and pepper was drunk by the family, and dry bread eaten. Many hard times followed but through it all Jim still maintained his smart gentlemany appearance. Changing each evening from working clothes into his one smart suit, with a newly washed and ironed shirt and stiffly starched collar. Jim would wax his moustache, place a flower in the button hole of his jacket and with his walking cane stride smarthr out to his Club. His fellow Club members sang a popular song of the day as he made his entrance to his Club, the song was called 'The man that broke the Bank at Monte Carlo'. On a cold wet day, when everyone was bored, George decided to brighten things up . He tied a piece of an old and smelly kipper in the middle of the washing line and everyone watched from the windows whilst the local cats attempted to tightrope walk to grab the kipper. Fred, very budget conscious, decided that the charge for the 'Knocker up' was exorbitant, as it had increased from two to four pence. Fred indignantly told the Knocker-up that her services were no longer required and as a result everyone was late for work. "Father had a few words to say to our Fred," said Edith . The boys of the family and some of their friends, formed a local Football team. They used the family kitchen as a changing room, (having first banned the girls from the house). Edith came back from shopping to find all her newly baked bread and Muffins, which was to last for a week, had been devoured by the football team. Alternative changing rooms had to be found by the team immediately.. They were banned from the house. Teenager, Madelene bought her first swim suit to take on a Works outing to the seaside. Very proud of her purchase she decided to try it on and go to show her next door neighbour. After a full discussion, the boys in the family secretly decided that the swim suit should be seen in its proper element, and as Madelene walked through the deserted yard to her next door neighbour, the boys leaned from an upstairs window and emptied buckets of very cold water over her. There are many, many amusing stories about the fun and practical jokes that occurred in this young family during the late 1920s and early 1930s , eg., An old bowler hat was left on the pavement on the corner of the street. The hat was a very tempting target for the local drunks to kick as they returned home late at night ... unfortunately, someone had put a large brick underneath the hat, and as a result there were a number of very sore and badly bruised toes in the area the following day. At another time, the lads, waiting until everyone was in bed and all the street very quiet and still ... found the largest oldest cracked jug around ... threw it high into the middle of the street ... then 'ran like hell' The lads rolled with laughter as all the bedroom curtains were pulled back and neighbours stuck their heads out of the windows to see who had fallen coming back from the Pub. Jim's family continued to live at number 1 Snowdon Street, Oldham until a number of them married and set up homes of their own. Neither Edith nor George married (the latter in spite of a Courtship with a girl lasting forty years). 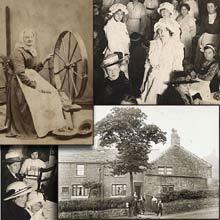 After the marriage of all the younger members of the family, Edith returned to work as a Winder whilst still caring for her Father and brother George. Both remained living at the family home, George until his death, and Edith until in her eighties, she moved to live with her widowed younger sister Madelene. Jim continued to work as a Brass Finisher until he retired at the age of 65 years. However, on the outbreak of the second World War, he returned to full-time work in order to help the War effort, by which time he was 73 years of age. He was compelled to retire from work completely, twelve months later. Gentleman Jim Sutton died in June 1947."